There is a lot of jargon used in the invoice finance industry, "prepayment" is one of many terms commonly used without explanation. Below we explain what a prepayment is. It can also be called an "early payment" or an "initial payment" by some providers. A prepayment is a cash advance against an unpaid sales invoice raised on credit terms, or application for payment - which are sometimes used in the construction sector instead of invoices. It is part of an invoice finance facility (also known as factoring and invoice discounting). If your sales invoice is worth say £100, an invoice finance company may agree a prepayment percentage of say 85%, you will then receive £85 when you raise the invoice. The remaining £15 is paid to you when it is paid, less the charges for using the service. That way you don't have to wait for customers to pay, before you can use the money. There are a myriad of types of invoice factoring and types of invoice discounting that involve prepayments, and advance rates will vary. The funder that you choose to use - percentages vary between providers. The industry sector that you operate within. Issues to do with your business, and your method of operation. Hopefully that has answered "what are prepayments", however it is worth knowing that not all levels of prepayment are the same. The actual prepayment percentage can be as high as 100% for some sectors e.g. body shop factoring, and it can be lower for others e.g. 70% for construction sector companies. In some cases it may be set even lower e.g. 50% if there are other risk issues affecting whether the invoices are likely to be paid in full. Even this level of funding can be very useful though. We can help you find out what percentage you can access for your company - we can also point you in the direction of companies that can maximise funding levels. There are other restrictions that can be placed on funding, in addition to the headline prepayment percentage e.g. prime debtor restrictions, debtor limits etc. 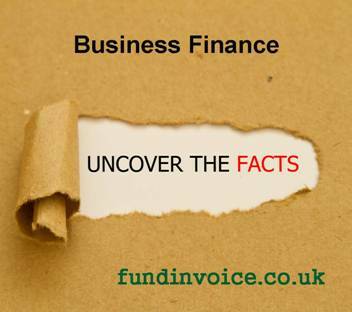 So it is important to consider all factors before making a decision on who to choose to fund your invoices.